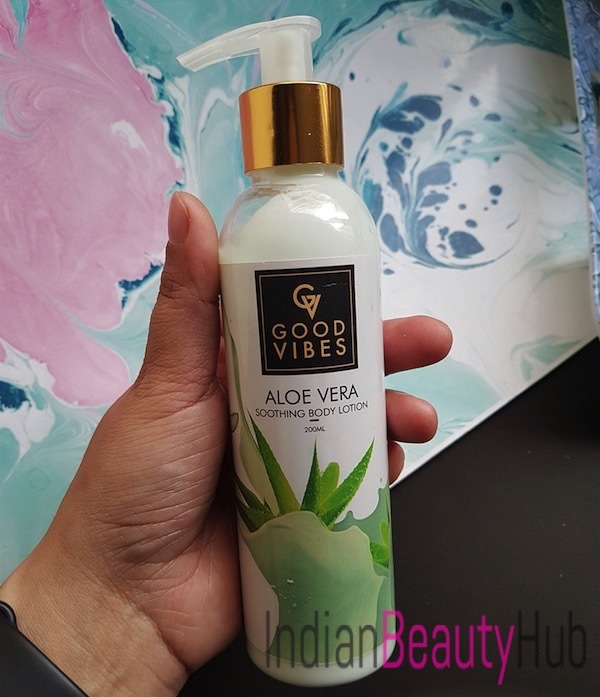 Hello everyone, today I am going to review the Good Vibes Soothing Aloe Vera body lotion. It is infused with some amazing natural ingredient that are known for their skin healing and calming properties. 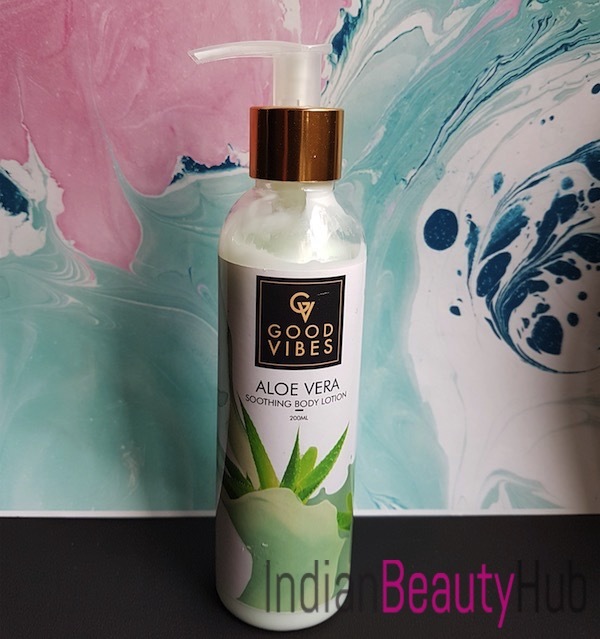 The price of the Good Vibes Soothing Aloe Vera body lotion is Rs.195 for 200ml and it is available at Purplle.com (Buy Here). Crafted with passion, skill, fresh ingredients and skin expertise. After all in life, all you need is Love, Moisture on your skin and Good Vibes! Packaging: The body lotion comes in a clear plastic bottle with pump dispenser. 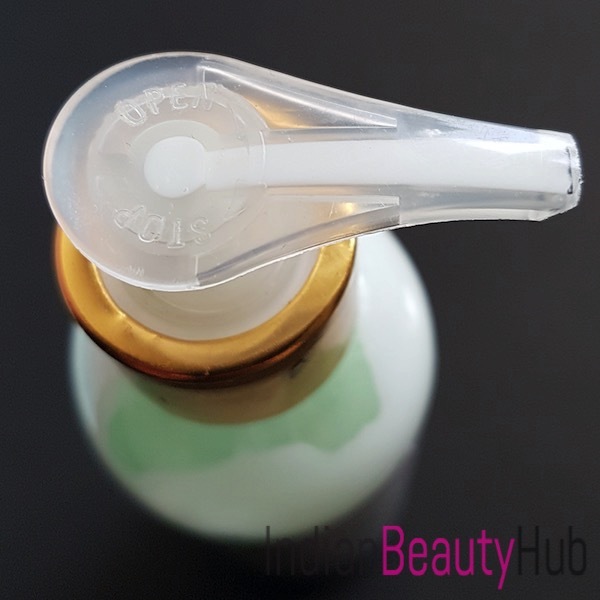 The bottle is sturdy and spill-proof and the see through bottle looks very refreshing to the eyes. The pump comes with a lock system and you need to twist the nozzle to open and close. 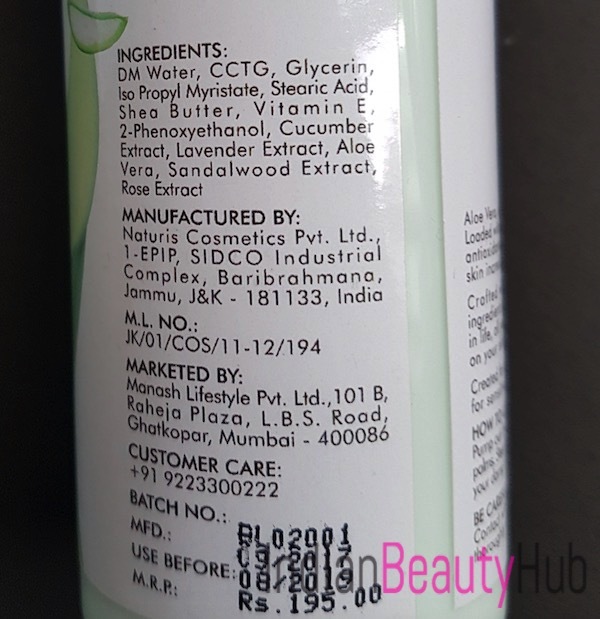 The important information related to the product is also labelled on the bottle. 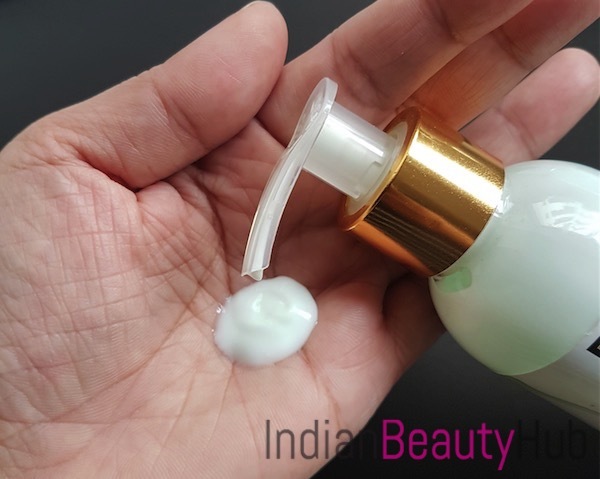 My Experience: The body lotion comes in a faint green color and has a creamy smooth texture. It has a herbal mix kind of scent which is not very pleasant. However, the fragrance is not very strong and vanishes completely after a few minutes of application. It spreads easily on the skin and absorbs completely with a little massage. It gives cooling sensation when applied on the skin which makes it an apt for hot summer days. It is moisturizing enough for normal skin and leaves the skin soft and nourished for good amount of time. However, it is not sufficiently moisturising for dry skin or during colder months. Nowadays, I have stopped using this lotion as my body skin is becoming very dry due to chill in the weather. Now I have switched to Nivea Nourishing body milk which is my all time favorite body lotion for the winters. The packaging is sturdy and the pump dispenser makes it very convenient to use. 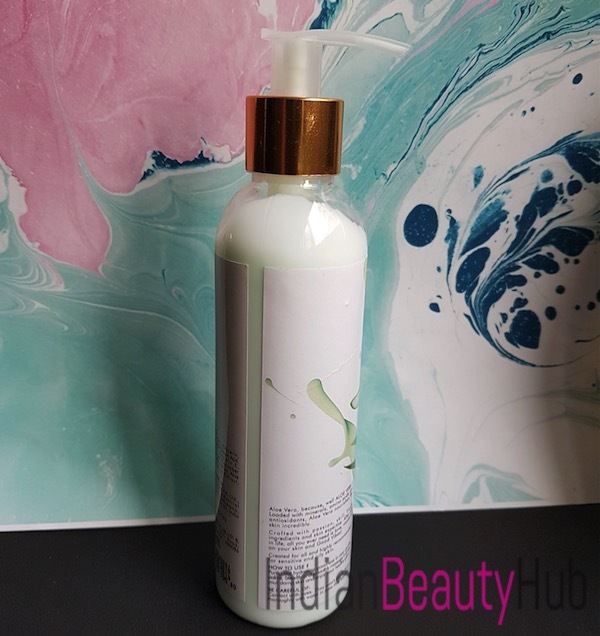 The body lotion has a creamy texture and a mild scent. It moisturizes normal skin nicely leaving the skin soft and hydrated throughout the day. 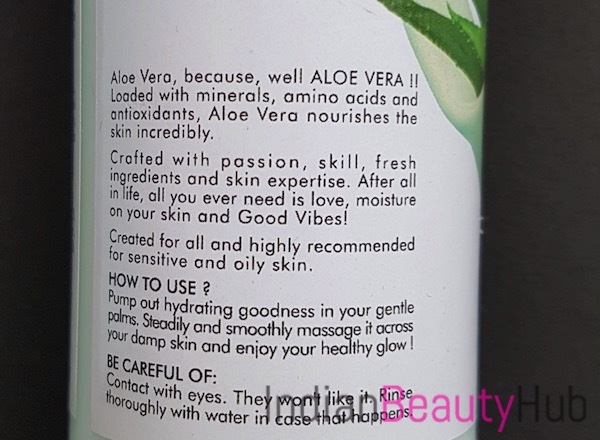 Enriched with aloe vera, lavender, rose, cucumber and sandalwood extracts. Suitable for oily to normal skin type. It is not enough moisturizing for dry skin neither a good choice for the colder months. Not widely available at offline stores. Full ingredients list is missing (preservatives are not mentioned). 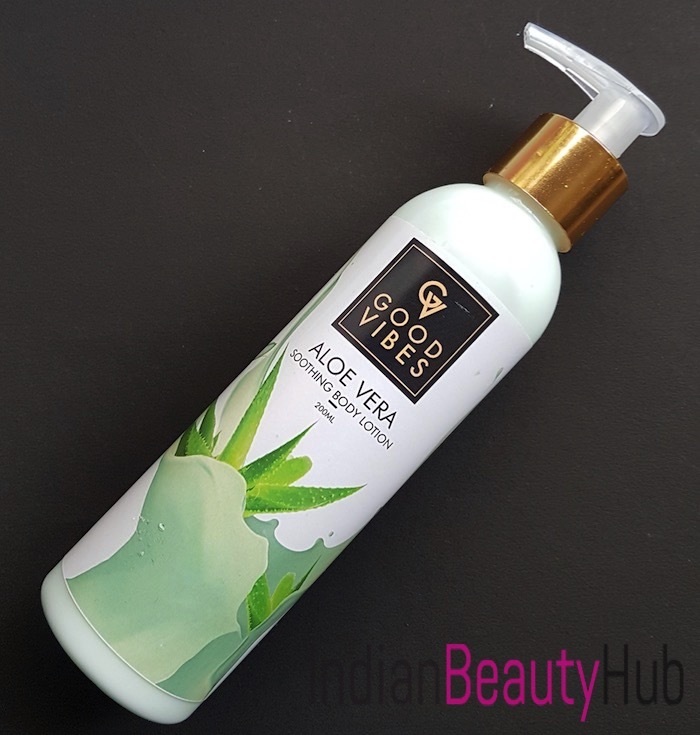 Overall, Good Vibes Soothing Aloe Vera body lotion is non-sticky, gets absorbed completely into the skin and leaves it soft & hydrated for long. 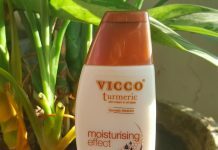 You can consider buying it if you are looking for a light body moisturizer for the summers. 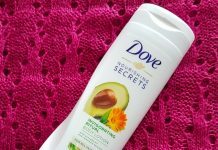 However, it is not ideal to use this body lotion during the colder months or if you have very dry skin. Recommended for normal to oily skin. What about its other products such as essential oils.